The November Carnival of Children's Literature is up at Wendy Wax's blog. I've heard that the blog illustration is Wendy's original artwork created specifically for this month's carnival. One of my favorite carnival stops: Alex Bough's The Children's War, a blog/journal "about books written for children and young adults about World War II." I found this interesting because one of the Gauthier boys was into reading children's books set in World War II during his late elementary/early middle school years. Bough's Carnival post deals with a Cherry Ames novel. Slate is running an excerpt from a n+1 article called MFA vs. NYC. The author, Chad Harbach (one of n+1's editors) argues that America has two literary cultures, one around MFA programs and one around the publishing world of New York. Now I knew that the number of MFA writing programs have skyrocketed in recent years, and I also knew that many MFA graduates are employed teaching in MFA programs. I just hadn't realized the magnitude of the numbers we're talking here. I was only aware of one MFA in writing back in my youth, which just goes to show how ignorant I was. According to Harbach, in 1975 there were 79. Now he says there are 854. My thought in the past regarding the explosion in graduate writing programs was, How irresponsible to be training large numbers of people to do something that so few of them will be able to support themselves doing since writing pays so badly. Foolish me. There appears to be a whole industry around studying for a MFA and then teaching others who are studying for a MFA. In the MFA culture the point of publishing a book isn't so much to make a living but to earn your credentials so you can get a job at a college and make a living. Oh, and a lot of MFA writing deals with short stories. This, I believe, helps to explain why I've had so little success publishing short stories. My writing may not actually be too dreadful to give away to an on-line publication. The competition from all those students in and graduates of those 854 writing programs may just be too great. Plus, you know, they've actually studied how to write a short story, which may bring us back to the argument that my writing may actually be too dreadful to give away. Harbach also says that NYC publishing is moving toward a Hollywood model, something I've believed for years. This is definitely a fascinating article that leads me to wonder which group children's writers fall into. Personally, I think I'm groupless, but what about children's writers in general? Do either of these models work for most or do we have another? I am finishing off my not very restful Thanksgiving weekend with links to my posts on YA Cybils nominees. As Easy as Falling Off the Face of the Earth by Lynne Rae Perkins. Fat Vampire by Adam Rex. 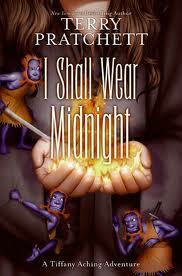 I Shall Wear Midnight by Terry Pratchett. The Cardturner by Louis Sachar. As luck would have it, I have two more Cybils nominees upstairs in my To Be Read pile. I just happened to pick them off the new book shelf at the library over the last month. I'll post about them when I've finished them. Well, unfortunately I planned to organize my Cybil posts by age. I say unfortunately because it looks to me as if I only happened to read two nominees that fall into the middle grade category. The Death-Defying Pepper Roux by Geraldine McCaughrean. Well, Thanksgiving is over at Chez Gauthier, for which I am very grateful. Not that I didn't enjoy it. But the three plus days of preparation spread over a couple of weeks, as well as the six hours of socializing has left me exhausted in a satisfying sort of way. Fortunately, I planned to be tired this weekend. Over the next few days I'm going to be posting links to the Cybil nominees I happen to have read this year. I'm starting with picture books and working my way up in age because I am extremely linear, and this was the line I could most easily find. Jimi: Sounds Like A Rainbow--A Story of the Young Jimi Hendrix by Gary Golio with illustrations by Javaka Steptoe. Lincoln Tells a Joke by Kathleen Krull and Paul Brewer with illustrations by Stacy Innerst. The Extraordinary Mark Twain (According to Suzy) by Barbara Kerley with illustrations by Edwin Fotheringham. Shark vs. Train by Chris Barton with illustrations by Tom Lichtenheld. Now I have to find a vacant spot on which to collapse. I don't usually do one reader response right after another, but yesterday I noticed that I Shall Wear Midnight by Terry Pratchett has been nominated for a Cybil, and since I'm going to be blogging about my Cybil reading over the Thanksgiving weekend, I thought I'd get something up about this book first. I Shall Wear Midnight is the finale to the Discworld novels about Tiffany Aching who starts out as a nine-year-old in her first book and is, I believe, around fourteen or fifteen in this one. Tiffany is a witch, for sure, but in Discworld witches do a lot more than fly around on broomsticks (though they do that) and scare people. They pretty much devote their lives to traveling around their neighborhoods as a sort of one woman Visiting Nurse Association. They tend wounds, help the sick, deliver babies, all your traditional manner. Additonally they do nontraditional things like removing pain from the suffering. They can remove physical pain, but not the psychic kind that comes from, say, grief. It's not a particularly easy life, and Tiffany is young to be shouldering all this responsibility. She has some folks watching out for her, though--a clan of six-inch high blue beings, the Nac Mac Feegle, also known as Feegles, also known as the Wee Free Men, also known as drunks, liars, brawlers, liars, and thieves. They are most endearing. Now, I have read the first book in the series, The Wee Free Men, and I have read the third book in the series, Wintersmith. I thought I'd read the second one, but I can't find any record of it. My point being, I Shall Wear Midnight makes references to those earlier books, especially Wintersmith. I, of course, remember little about them. Even though the crisis Midnight deals with came about because of something Tiffany did in Wintersmith, not recalling it didn't really bother me. I was able to brush off what I didn't know and move on, probably in part because I've read enough Discworld books now that I know I want to be there in the world of those stories, and I'm willing to ignore anything that bothers me in order to get there. And, of course, when there are Wee Free Men in the mix, it's easy to ignore all kinds of things. I Shall Wear Midnight has some allegorical elements. It involves someone called the Cunning Man who appears to be the personification of evil. He is able to spread hate among people, making them turn on others. Witches, for instance. He comes, spreads his evil, is defeated for a while, and years later comes again. I think we're talking ugly mob mentality in many places, the kind of thing that has cropped up over and over again throughout history. As a general rule, I don't care for allegory because it strikes me as being very holier than thou. However, there are Wee Free Men in this allegory. I'll put up with a lot of holier than thou for their sake. This book includes a fascinating Author's Note in which Pratchett writes about a story from his childhood that inspired one element of this book. It's an interesting piece about how long something can sit in writers' minds before they finally are able to use it. I've mentioned before that I've read two series this past year, one of which included eighteen or nineteen books. Maybe twenty. The author hasn't been updating her website, and I lost the sheet on which I was keeping track. I Shall Wear Midnight has a very nice list of all the Discworld books, and I'm considering reading all of them now. Perhaps I'll wait until January. Yeah. That's the ticket. I'm going to wait until January, and then start reading Discworld. Plot Project: Yes, this plot could be one in which the protagonist wanted something--to destroy the Cunning Man--and the author kept giving her obstacles to getting it. But first the author had to come up with the Cunning Man. This is what is so simplistic about this whole give characters something they want and then throw obstacles in their way scenario. How do you come up with what they want in the first place? The Faceless Ones, the third in the Skulduggery Pleasant series by Derek Landy, makes a number of references to earlier Skulduggery Pleasant books. I've read both the first and second installments, and I liked them. But as I was reading the early parts of The Faceless Ones, I kept thinking, gee, I don't remember much from the other books. It didn't matter. I moved on with the story with no problem. This is a Skulduggery Pleasant book, so, basically, what it's about is Stephanie/Valkyrie and her skeletonized mentor, Skulduggery, saving the world from magical evil. What distinguishes it from a few thousand other books about a kid and a magical mentor saving the world from evil is the witty repartee. Many writers think they're writing witty repartee, but merely thinking it doesn't make it so. Landy is actually able to pull it off. This time around there's a suggestion that Skulduggery may not be some kind of hero on a white horse (metaphorically speaking, since he drives a Bentley). Maybe it was in the other books, and I just don't recall. I don't recall as much of a cliffhanger ending in the other books, either, though there definitely is a serial thing going on. 1. Several adult characters point out that Stephanie/Valkyrie, our protagonist, is only fourteen years old, and, really, should she be out fighting evil? What an excellent point. How many of these books hinge on a child saving a civilization even though the child is only, say, eleven and there are plenty of adults who ought to be shouldering the task? No one notices that? Where's the Department of Children and Youth Services in these stories? I know, I know. Willing suspension of disbelief. 2. Aren't people with magical powers just a bit superior to people without them? When you are going "Oh, I must use my magical powers to save the world...again," aren't you implying that you are just better than all those people who can't save the world...again...because they don't have magical powers like yours? Didn't those wizards and their special train that took them to their special school that only they knew about because they were so special really get on your nerves after a while? Oops. Another series. Yes, Landy was setting something up when he brought up the aren't-you-guys-a-little-full-of-yourselves thing, but, still, it's an interesting question. Plot Project: This could very possibly be the kind of story in which the plot was developed around the main character wanting something--to stop the Faceless Ones--and then having stumbling blocks thrown in front of her over and over. The National Book Awards were announced very recently. I don't know. Yesterday? The day before? Blog of a Bookslut linked to a NBA page with a video of the ceremony. I haven't watched the ceremony, but I did get kind of blown away by the Stats list on this page. I was aware that only publishers nominated books, that they had to pay a fee to do so, and that they had to agree to pay $1,000 toward a promotional campaign if the book they nominated made the short list. Under those circumstances, I assumed that publishers didn't nominate everything on their lists by a long shot. I'm also assuming publishers try to guess what kinds of books usually win and then try to nominate something similar from their list. I'm not being critical when I say that, by the way. We can't any of us throw money away. What totally stunned me, though, was how few books are nominated for these awards. We've been told that around a million books were published last year. Of those, 1,115 were submitted for consideration over four categories? Even when you consider that a lot of crap is published every year, some of it by traditional publishers, that is still a very, very small portion of the whole to be considered worthy of consideration. I know that my thoughts are easily provoked, but, come on...Last year the publishing industry only published that many books that publishers, themselves, felt were award worthy? Does anyone else find that odd? Are these awards really given for the best of a year's publishing or for the best of the few hundred books the judges are able to consider? On Beyond Words & Pictures is taking part in a blog tour for Grandma's Chocolate. For the OBW&P stop, author Mara Price did a nice little piece on the importance of chocolate in Mesoamerica. Get this, Mayan nobles were buried with jars of chocolate. Well, there are a lot of people these days who would like to take it with them, too. After spending some time recently with Jimi: Sounds Like a Rainbow-A Story of the Young Jimi Hendrix by Gary Golio, I was interested to stumble upon another picture book biography of a guitarist. The musician involved this time is Django (Jean) Reinhardt, a mid-twentieth century French jazz guitarist. 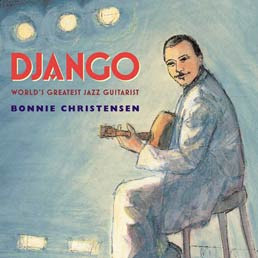 The story of his childhood and adolescence is told in Django: World's Greatest Jazz Guitarist by Bonnie Christensen. I think it's safe to say that Reinhardt will be even less well-known to young picture book readers than Hendrix. To today's young readers, I think Hendrix's story will seem the more traditional, because while he was an innovative rock guitarist as an adult, his youth, as portrayed in Jimi: Sounds Like a Rainbow, is the familiar poor child follows his bliss and becomes successful. Reinhardt's story involves a poor child who goes the bliss route and becomes successful, too. But it will be more exotic to U.S. readers because instead of being born into a poor black family, a very American scenario, he was born into a poor Roma family, something we don't hear so much about in this country. He was already making a name for himself as a jazz musician when, at the age of eighteen, he was so badly burned in a caravan fire, particularly his left hand, that the doctors didn't believe he'd be able to play the guitar again. But within a couple of years, he'd found a way to compensate and play using primarily just two fingers for the fretwork. This is the basic story in Django. Got some drama there, eh? The author's note at the back of the book picks up on the rest of his life. This guy was in England when WWII broke out and went back to Paris for the duration. I've got to wonder if there wasn't a story there, too, because Hitler sure wasn't a friend of the Roma. Christensen says the Nazis may have killed close to one and a half million of them. How did Reinhardt manage? Like Jimi: Sounds Like a Rainbow, this is a book that could be used for a number of things, combined with both music and history. In Memory of the Genius Django Reinhardt is a YouTube tribute that provides both images and music. I've been obsessing about plot these last couple of years. You can catch a brief plot talk at Mitali Perkin's blog post Virtual Author Visit. She says she begins with a character, which is what I've done with a couple of manuscripts recently. Developing character seems like a good way to back into plot. Note also that she knows what's going to change for the character. That's an extremely helpful idea. I read somewhere that it's a good idea to know the mid-point of your plot. I liked that, but knowing about a change seems even better. Notice that Mitali doesn't say anything about conflict, nor does she say anything about giving her character something to want and then putting up roadblocks to getting it. She talks about change. That is so...dynamic. Speaking of Mitali, I'll just mention here that I had a nightmare about her a few days ago. I was going to give a presentation at her house. (Which I've never seen, but who needs to actually see things in order to dream about them? Not me!) I hadn't given a presentation in years, this one was brand new, and I just did not know the material. Evidently I had to spend the night before the presentation at her house. When I got up the next morning, there were too many people there, and I couldn't get into the bathroom to get dressed before the audience started arriving for the presentation. Also, Mitali had a dog that got sick all over the place. That is obviously a brand speaking new variation on two classic performance anxiety nightmares: 1. Caught at school in your pjs and 2. Exam morning and you haven't opened your textbook all semester. Well, I walked over to the Connecticut Children's Book Fair today where I attended a talk given by Jon Muth, whom I like to think of as the Zen bear guy. He inspired me to do some sketching for my work in progress. I'm not talking about creating illustrations here, folks. Don't panic. I'm talking about laying out the street the kids live on, doing a site plan for one spot, and planning a couple of cemeteries that will figure into the story. I've had to do floor plans of houses for books I've been working on before, but Muth made me feel that maybe starting my day with that on Monday might be a more creative jumpstart than, say, yakking with my friends on the kidlitosphere listserv, or slipping back into my old pre-writing ritual/transitional activities of checking news sites and playing solitaire. I also bought a copy of The Phantom Tollbooth, which Norton Juster signed for me. While I had my wallet out, I bought Tales From Shakespeare, a book of prose versions of ten of Shakespeare's plays by Tina Packer. I was able to have it signed by both Muth, who illustrated the introduction, and Barbara McClintock, who illustrated As You Like It. So, you may ask, Gail? You and Shakespeare? Since when? Okay, this is why I bought the book. You know Charles Lamb, right? The late eighteenth/early nineteenth century essayist? Of course, you do. Well, Chuck and his sister Mary (yeah, that Mary Lamb) wrote a book called Tales From Shakespeare in, oh, I don't know, 1807, I think. 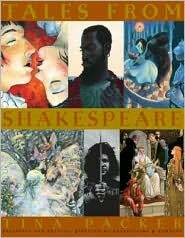 In 1956 Grosset & Dunlap published Favorite Tales From Shakespeare (Donald Lynch, illustrator), which was, you guess it, Charles and Mary Lamb's works "edited for modern readers by Morris Schreiber." At some point, someone calling themselves "Aunt Agnes and Uncle Gus" gave a copy of this book to a member of my family. To be honest, it was a member of my husband's family. No Gauthier would ever buy anything with the name Shakespeare on it for a gift or anything else. And to be perfectly honest, the book was given to my husband. I now own that book. It's in beautiful shape, probably because my husband swears he never so much as cracked it open. So I thought it would be really cool to own another prose version of Shakespearean plays for children and, perhaps, to compare them. I know. Hahahahahah. Like that will ever happen! But I'm loving owning this beautiful book. I saw people I knew today. I met some new people. I talked with another writer who said she hasn't made any sales in quite a while, either. I did about fifty minutes to an hour of walking going back and forth across the UConn campus. And I now own a book that I'd never even heard of eight hours ago. Really, you can't ask for much better from a fair. I loved Corbenic by Catherine Fisher when I read it four years ago, I believe for the Cybils. I wasn't quite so taken by Incarceron, though I did get to a class a little late so I could finish it. Corbenic had a real world, contemporary setting with a possible fantasy/possible madness element. I do prefer my fantasy with a real world connection. Incarceron also has a dual world thing going on, though the "real" world is a fantasy world and the second one is definitely real but in a fantasy way, if you follow that. The real world involves another post apocalyptic dystopia. In this one, a king from the past made the decision that this world would give up its technologically advanced present to live in a romanticized past because that would make everyone happier. So while these people had all kinds of technology, they had to live in a kind of late eighteenth/early nineteenth century world, right down to the point of living with antiquated health care. Some of this fake world they lived in was created with their technology. Incarceron, in the meantime, is a prison that is some kind of living system. It was created as a humane way of dealing with criminals. It is a closed world, no one gets out or in (presumably), and the living system has become nasty and destructive. So what we've got here are two very traditional YA fantasy schemes. We've got a dystopian story and a Frankenstein tale of mankind messing with a lifeform and that never ends well. Each tale has its own protagonist. They've never met, but they are still connected. And each protagonist has identity issues. Who are these people? I think the familiarity of these stories disappointed me a bit because I found Corbenic so unique. However, Fisher is a marvelous writer so familiar or not, Incarceron is still a fine book. Incarceron is the first in a series, and while the story's finale is a little open-ended, there is better closure than you often get in series books. The second book, Sapphique, will be published in this country next month. The Plot Project: Incarceron's plot could definitely have been created with the give a character something to want and then put up roadblocks to getting it scheme. However, this book illustrates the risk authors take if they use that method. Finn wants to get out of Incarceron, and he's on a sort of journey/quest to do so. One thing after another stops him. It's a little harder to tell what Claudia wants. To avoid marrying Caspar? To tick off her father? At any rate, they both, particularly Finn, just keep running up against one obstacle after another. Personally, I think that can get a little frustrating for a reader. Mitali Perkins is doing what she calls a Cuci Mata project over at the Fire Escape. Once a month she's leading a discussion of a children's classic focusing on race, ethnicity, gender, and class. She and her followers will be looking for what qualifies the book as a classic, but also looking to see if the attitudes in the book are dated in terms of how we feel about race, ethnicity, gender, and class now. I'm planning to take part in next month's discussion of An Old-Fashioned Girl by Louisa May Alcott. I guess I'd better start looking for a copy. Believe it or not, I might have one. Meet Some of the Thousands of Kids Doing NaNoWriMo. I found Lisa Rowe Fraustino's post at Cynsations on The Benefits of Keeping Your Day Job particularly interesting because recently I read an article about a writer who quit hers after publishing her first book. She has a three-book deal and quit her job to write full time. The article said her first title was published "to acclaim," but it isn't a title that's getting the buzz of, say, a Twilight or a Hunger Games. I wonder if this writer realizes what she might end up with for income these next few years. For a long time I've been interested in writing what I think of as kiddie noir--a kid-level version of the dark, hardboiled, mystery stories made popular in the 1930s by Dashiell Hammett and Raymond Chandler. Well, I don't need to feel any rush to do that because Jack D. Ferraiolo has done it with The Big Splash. Matt Stevens is most definitely the classic, outsider noir hero with a personal code that he must adhere to. In the slightly twisted middle school world in which he lives, a young crime boss rules the cafeteria and hallways, aided by his personal bodyguards. He controls the sale of sweets in school, as well as the sale of test answers and fake hall passes. There is law at Franklin Middle School. It takes the form of hall monitors, led by one tough customer named Katie Condor. What is Matt's place in this scheme of things? He is neither criminal nor lawman, but something separate, a private detective who students hire for various tasks. The adults at the school are pretty much invisible. The student subculture is the one kids really live in. Unless, of course, they are humiliated by being shot in the crotch with water pistols usually filled with cat urine. No one survives that. The humiliated spend the rest of their student lives in the Outs. Moving on to high school is no escape. Once in the Outs, always in the Outs. Yes, it's an over-the-top premise but it's laid out on the page as given by first-person narrator Matt who speaks in classic noir simili. Of Joey Renoni, also known as the Hyena, Matt says on the very first two pages, "He scanned the crowd constantly as we walked, his head swiveling back and forth in a herky-jerky motion, like a lawn sprinker with the hiccups." Just a few pages later, he says of himself, "Apparently, I wore my thoughts like makeup on a little girl: all over my face." The noir style is so well done that it would be very difficult not to accept the world it describes. The Big Splash is filled with goons and heavies and femme fatales and damselles in distress. The young women in this book are fantastic. They may wear ponytails and, in at least one case, carry binders with horse stickers pasted all over them, but they are tough and powerful. And while all the characters are clever takeoffs on their adult counterparts in adult noir stories, many of them also have some serious depth going for them, too. Nikki Fingers--there's a heart-breaking bad girl. This is a two-year-old book that seems to have been well-reviewed when it was published, but I missed it until a local librarian bought it a few months ago. It really deserves a wide readership. Plot Project: This is an idea/concept plot rather than a give-a-character-something-to-want-and-keep-it-from-him plot. 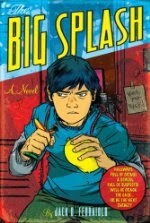 The Big Sleep clearly provided some inspiration for The Big Splash, though it's been years since I've read it so I don't know if the plots are at all similar. A few years back, I learned that in the nineteenth century American schools made the switch from teaching rhetoric to teaching English literature in order to deal with Anglo-Americans' fears regarding large numbers of recent immigrants. Instead of teaching the children of immigrants how to use the English language, America would teach them to be Anglo-American by forcefeeding them reverance for Anglo-American (mainly anglo) literature. I know that sounds a bit hostile, but I heard it from an Italian-American English professor who was nowhere near old enough to have lived through that period but was definitely bitter nonetheless. I must admit, I was shaken to think that I had spent my college years majoring in a field that was created to control my grandparents and my father and his siblings. But, hey, Dad, Uncle Isidore, and all but one of my aunts beat the system! They all dropped out of the American school system before high school! There was no controlling them! Booyah! My question is, why do we teach English literature, particularly on the high school level, these days? Are we still trying to teach respect for the "correct" literature? Maintain and improve reading skills to prepare literate citizens who can read about and comprehend issues and thus make educated, informed choices at the voting booth? Encourage life-long reading for both personal and professional enrichment? Think about this and get back to me. I didn't blog last night because I was so busy reading How Much is an Author Obligated to Say? at A Fuse #8 Production. Don't miss the discussion after the post. My feeling about this issue is that a fiction writer's statement is supposed to be on the page, within the story. Research is supposed to support that story by providing the writer with details for creating characters, setting, plot, point of view, voice...the elements of fiction. The piece of writing is what it is. It's on the page, it's done. Sympathy or respect for the author because of her experience with a subject can't change what's on the page. If it changes readers' impression of what's on the page, that has nothing to do with the quality of what the writer did with her work. It shouldn't have any impact on the assessment of the writing. The writing has to stand on its own.